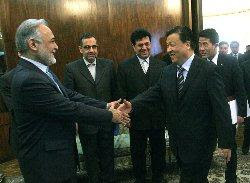 "The Economic and Cultural Ideas of Capitalism Have Reached an End"
First Vice-President Parviz Davoudi in a meeting with a visiting Chinese senior official here on Saturday, by referring to the world current financial crisis, said the situation has provided an appropriate opportunity to design a new economic and cultural system. Referring to the current economic and financial crisis in the west, the VP said, "Tehran and Beijing are in a good direction economically and the necessity for developing bilateral ties is felt more and more." Advisor to the China president said, "Iran's prediction on the west financial system was correct and the international financial network should be corrected and the role of regional mechanisms should be strengthened."